Okay, that’s not 100% true 100% of the time. Freak accidents and acts of nature occur. But, if we do nothing to prepare, when those disasters strike, don’t we share some of the blame for the fallout? Here in the last of our Crime In Healthcare series before our big wrap-up, we’re focusing on one of the slipperiest elements of the topic. When bad things happen and, through negligence or lack of preparedness, they happen on your watch. Accidents happen. But when an accident happens over and over, often getting worse, it’s not an accident anymore. Saying that a substandard practice, procedure, or product is “probably okay” is how infants die of a bacterial infection. It’s how the standards for surgery slip so far that a facility run by even the prestigious Johns Hopkins can triple its mortality rate. Most problems of negligence are much smaller and less sensational. Babies dying makes the news. But it could be something as simple (and complex) as mismanaging hospital finances so badly that the facility becomes a threat to its patients. The most frustrating part is that, even if you inform the proper channels of a problem, that’s no guarantee that it will be fixed. The above situations that led to infant mortality were reported to hospital leadership. But they were ignored or - worse - covered up. In trying to do the right thing for one, we can hurt many. It’s unfortunate that people we work alongside, people whose company we value, are capable of hurting others. And the instinct to protect those close to us is natural. But as soon as you cover for someone, you become complicit in their actions. And liable for the damage they cause. The examples of this are too numerous and frequent to point them all out. But let’s look at examples of systemic denial, then cover-up, that comes not from sports, government, or the church. They happened in healthcare. When victims came forward to tell their stories of abusive VA doctors and a USC doctor who behaved inappropriately for decades, these trusted institutions decided that their employees’ careers were more valuable than their patients’ wellbeing. Which is, obviously, contrary to the core mission of healthcare. In fact, abuse is rampant enough in healthcare that the #TimesUp movement has made its overtures in the field official. This isn’t fun to talk about, we realize. These aren’t Ocean's Eleven-esque criminals you can root for. But we can’t pretend it’s not happening. The more we talk about it, the more we can talk about it. And the more the discussion is normalized, the more we can do something about it. Allowing the unfortunate to befall patients and healthcare workers isn’t always a matter of knowing what is happening and not doing enough. Being unprepared for misfortune doesn’t necessarily cause it to occur, but it doesn’t help. Advocates of technologies like blockchain and RFID claim that they can help reduce crime in the healthcare supply chain. Blockchain is meant to make transactions and communication more secure. RFID can be leveraged to keep more accurate and up-to-date records. But you don’t have to implement a new technology or expensive solution. The most basic solution might be to increase healthcare interoperability. Communication is just as crucial between departments as between facilities. Our own CEO had some thoughts on healthcare interoperability and communication that you might want to check out in this roundup of healthcare leadership on the subject. So… what now? It’s the obvious question. And it’s one that we hope to begin answering in our next and final installment of the Crime In Healthcare series. Until then, the old standby of “See Something, Say Something” will serve you pretty well. And this advice from one of our blogs last year might not be so bad, either. Do what you can where you can. Make noise. Be decent. This is Part Four in Z5 Inventory’s five-part “Crime In Healthcare” series. To see all the published entries, click here. 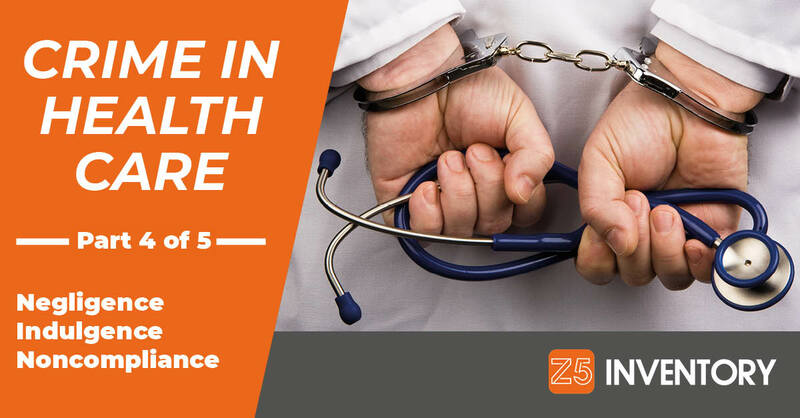 If you know of a story of healthcare crime that you think we should feature, email info@z5health.com. Cover photo by Depositphotos and Z5 Inventory.